1 D None No Power Seat 1 D is a standard Business Class seat that transforms into a fully flat bed. 1 G None No Power Seat 1 G is a standard Business Class seat that transforms into a fully flat bed. 12 A None No Power Seat 12 A is a standard Business Class seat that transforms into a fully flat bed. A window is not present due to the structure of the aircraft. For some, this might add to the feeling of privacy. 12 D None No Power Seat 12 D is a standard Business Class seat that transforms into a fully flat bed. 12 G None No Power Seat 12 G is a standard Business Class seat that transforms into a fully flat bed. 12 L None No Power Seat 12 L is a standard Business Class seat that transforms into a fully flat bed. A window is not present due to the structure of the aircraft. For some, this might add to the feeling of privacy. 15 A None No Power Seat 15 A is a standard Business Class seat that transforms into a fully flat bed. 15 L None No Power Seat 15 L is a standard Business Class seat that transforms into a fully flat bed. 26 D None No Power Seat 26 D is a standard Economy Plus seat that may have limited legroom due to the bulkhead. There is no floor storage for this seat during takeoff and landing. The tray table and inflight entertainment monitor are in the armrest, making the armrest immovable and slightly reducing seat width. 26 E None No Power Seat 26 E is a standard Economy Plus seat that may have limited legroom due to the bulkhead. There is no floor storage for this seat during takeoff and landing. The tray table and inflight entertainment monitor are in the armrest, making the armrest immovable and slightly reducing seat width. 26 F None No Power Seat 26 F is a standard Economy Plus seat that may have limited legroom due to the bulkhead. There is no floor storage for this seat during takeoff and landing. The tray table and inflight entertainment monitor are in the armrest, making the armrest immovable and slightly reducing seat width. 26 G None No Power Seat 26 G is a standard Economy Plus seat that may have limited legroom due to the bulkhead. There is no floor storage for this seat during takeoff and landing. The tray table and inflight entertainment monitor are in the armrest, making the armrest immovable and slightly reducing seat width. 27 A None No Power Seat 27 A is a standard Economy Plus Class seat. There is no floor storage for this seat during takeoff and landing. The tray table and inflight entertainment monitor are in the armrest, making the armrest immovable and slightly reducing seat width. 27 B None No Power Seat 27 B is a standard Economy Plus Class seat. There is no floor storage for this seat during takeoff and landing. The tray table and inflight entertainment monitor are in the armrest, making the armrest immovable and slightly reducing seat width. 27 C None No Power Seat 27 C is a standard Economy Plus Class seat. There is no floor storage for this seat during takeoff and landing. The tray table and inflight entertainment monitor are in the armrest, making the armrest immovable and slightly reducing seat width. 27 J None No Power Seat 27 J is a standard Economy Plus Class seat. There is no floor storage for this seat during takeoff and landing. The tray table and inflight entertainment monitor are in the armrest, making the armrest immovable and slightly reducing seat width. 27 K None No Power Seat 27 K is a standard Economy Plus Class seat. There is no floor storage for this seat during takeoff and landing. The tray table and inflight entertainment monitor are in the armrest, making the armrest immovable and slightly reducing seat width. 27 L None No Power Seat 27 L is a standard Economy Plus Class seat. There is no floor storage for this seat during takeoff and landing. The tray table and inflight entertainment monitor are in the armrest, making the armrest immovable and slightly reducing seat width. 28 D None No Power Seat 28 D is a standard Economy Plus Class seat. 28 E None No Power Seat 28 E is a standard Economy Plus Class seat. 28 F None No Power Seat 28 F is a standard Economy Plus Class seat. 28 G None No Power Seat 28 G is a standard Economy Plus Class seat. 29 D None No Power Seat 29 D is a standard Economy Plus Class seat. 29 E None No Power Seat 29 E is a standard Economy Plus Class seat. 29 F None No Power Seat 29 F is a standard Economy Plus Class seat. 29 G None No Power Seat 29 G is a standard Economy Plus Class seat. 30 A None No Power Seat 30 A is a standard Economy Plus Class seat. 30 B None No Power Seat 30 B is a standard Economy Plus Class seat. 30 C None No Power Seat 30 C is a standard Economy Plus Class seat. 30 D None No Power Seat 30 D is a standard Economy Plus Class seat. 30 E None No Power Seat 30 E is a standard Economy Plus Class seat. 30 F None No Power Seat 30 F is a standard Economy Plus Class seat. 30 G None No Power Seat 30 G is a standard Economy Plus Class seat. 30 J None No Power Seat 30 J is a standard Economy Plus Class seat. 30 K None No Power Seat 30 K is a standard Economy Plus Class seat. 30 L None No Power Seat 30 L is a standard Economy Plus Class seat. 31 A None No Power Seat 31 A is a standard Economy Plus Class seat. 31 B None No Power Seat 31 B is a standard Economy Plus Class seat. 31 C None No Power Seat 31 C is a standard Economy Plus Class seat. 31 D None No Power Seat 31 D is a standard Economy Plus Class seat. 31 E None No Power Seat 31 E is a standard Economy Plus Class seat. 31 F None No Power Seat 31 F is a standard Economy Plus Class seat. 31 G None No Power Seat 31 G is a standard Economy Plus Class seat. 31 J None No Power Seat 31 J is a standard Economy Plus Class seat. 31 K None No Power Seat 31 K is a standard Economy Plus Class seat. 31 L None No Power Seat 31 L is a standard Economy Plus Class seat. 32 A None No Power Seat 32 A is a standard Economy Plus Class seat. 32 B None No Power Seat 32 B is a standard Economy Plus Class seat. 32 C None No Power Seat 32 C is a standard Economy Plus Class seat. 32 D None No Power Seat 32 D is a standard Economy Plus Class seat. 32 E None No Power Seat 32 E is a standard Economy Plus Class seat. 32 F None No Power Seat 32 F is a standard Economy Plus Class seat. 32 G None No Power Seat 32 G is a standard Economy Plus Class seat. 32 J None No Power Seat 32 J is a standard Economy Plus Class seat. 32 K None No Power Seat 32 K is a standard Economy Plus Class seat. 32 L None No Power Seat 32 L is a standard Economy Plus Class seat. 33 A None No Power Seat 33 A is a standard Economy Plus Class seat. 33 B None No Power Seat 33 B is a standard Economy Plus Class seat. 33 C None No Power Seat 33 C is a standard Economy Plus Class seat. 33 J None No Power Seat 33 J is a standard Economy Plus Class seat. 33 K None No Power Seat 33 K is a standard Economy Plus Class seat. 33 L None No Power Seat 33 L is a standard Economy Plus Class seat. 37 A None No Power Seat 37 A is a standard Economy Class seat, however the proximity to the lavatories might be bothersome. 37 B None No Power Seat 37 B is a standard Economy Class seat, however the proximity to the lavatories might be bothersome. 37 C None No Power Seat 37 C is a standard Economy Class seat, however the proximity to the lavatories might be bothersome. 37 D None No Power Seat 37 D is a standard Economy Class seat, however the proximity to the lavatories might be bothersome. 37 E None No Power Seat 37 E is a standard Economy Class seat, however the proximity to the lavatories might be bothersome. 37 F None No Power Seat 37 F is a standard Economy Class seat, however the proximity to the lavatories might be bothersome. 37 G None No Power Seat 37 G is a standard Economy Class seat, however the proximity to the lavatories might be bothersome. 37 J None No Power Seat 37 J is a standard Economy Class seat, however the proximity to the lavatories might be bothersome. 37 K None No Power Seat 37 K is a standard Economy Class seat, however the proximity to the lavatories might be bothersome. 37 L None No Power Seat 37 L is a standard Economy Class seat, however the proximity to the lavatories might be bothersome. 38 A None No Power Seat 38 A is a standard Economy Class seat, however the proximity to the lavatories might be bothersome. 38 B None No Power Seat 38 B is a standard Economy Class seat, however the proximity to the lavatories might be bothersome. 40 A None No Power Seat 40 A is a standard Economy Class seat, however the proximity to the lavatories might be bothersome. There is no floor storage for this seat during takeoff and landing. The tray table and inflight entertainment monitor are in the armrest, making the armrest immovable and slightly reducing seat width. 40 B None No Power Seat 40 B is a standard Economy Class seat, however the proximity to the lavatories might be bothersome. There is no floor storage for this seat during takeoff and landing. The tray table and inflight entertainment monitor are in the armrest, making the armrest immovable and slightly reducing seat width. 40 C None No Power Seat 40 C is a standard Economy Class seat, however the proximity to the lavatories might be bothersome. There is no floor storage for this seat during takeoff and landing. The tray table and inflight entertainment monitor are in the armrest, making the armrest immovable and slightly reducing seat width. 40 J None No Power Seat 40 J is a standard Economy Class seat, however the proximity to the lavatories might be bothersome. There is no floor storage for this seat during takeoff and landing. The tray table and inflight entertainment monitor are in the armrest, making the armrest immovable and slightly reducing seat width. 40 K None No Power Seat 40 K is a standard Economy Class seat, however the proximity to the lavatories might be bothersome. There is no floor storage for this seat during takeoff and landing. The tray table and inflight entertainment monitor are in the armrest, making the armrest immovable and slightly reducing seat width. 40 L None No Power Seat 40 L is a standard Economy Class seat, however the proximity to the lavatories might be bothersome. There is no floor storage for this seat during takeoff and landing. The tray table and inflight entertainment monitor are in the armrest, making the armrest immovable and slightly reducing seat width. 41 D None No Power Seat 41 D is a standard Economy Class seat, however the proximity to the lavatories might be bothersome. There is no floor storage for this seat during takeoff and landing. The tray table and inflight entertainment monitor are in the armrest, making the armrest immovable and slightly reducing seat width. 41 E None No Power Seat 41 E is a standard Economy Class seat, however the proximity to the lavatories might be bothersome. There is no floor storage for this seat during takeoff and landing. The tray table and inflight entertainment monitor are in the armrest, making the armrest immovable and slightly reducing seat width. 41 F None No Power Seat 41 F is a standard Economy Class seat, however the proximity to the lavatories might be bothersome. There is no floor storage for this seat during takeoff and landing. The tray table and inflight entertainment monitor are in the armrest, making the armrest immovable and slightly reducing seat width. 41 G None No Power Seat 41 G is a standard Economy Class seat, however the proximity to the lavatories might be bothersome. There is no floor storage for this seat during takeoff and landing. The tray table and inflight entertainment monitor are in the armrest, making the armrest immovable and slightly reducing seat width. 5 L None No Power Seat 5 L is a standard Business Class seat that transforms into a fully flat bed. 50 C None No Power Seat 50 C is a standard Economy Class seat, however the crew and passengers may bump into this seat. 50 J None No Power Seat 50 J is a standard Economy Class seat, however the crew and passengers may bump into this seat. 52 D None No Power Seat 52 D is a standard Economy Class seat, however the proximity to the lavatories and galley might be bothersome. 52 G None No Power Seat 52 G is a standard Economy Class seat, however the proximity to the lavatories and galley might be bothersome. 52 L None No Power Seat 52 L is a standard Economy Class seat located in a last row of the aircraft. Seat back recline might be limited due to the wall directly behind. Also, if the seat back in front is reclined, then personal space will be reduced. The proximity to the galley and lavatory area might be bothersome. 53 D None No Power Seat 53 D is a standard Economy Class seat located in a last row of the aircraft. Seat back recline might be limited due to the wall directly behind. Also, if the seat back in front is reclined, then personal space will be reduced. The proximity to the galley and lavatory area might be bothersome. 53 E None No Power Seat 53 E is a standard Economy Class seat located in a last row of the aircraft. Seat back recline might be limited due to the wall directly behind. Also, if the seat back in front is reclined, then personal space will be reduced. The proximity to the galley and lavatory area might be bothersome. 53 F None No Power Seat 53 F is a standard Economy Class seat located in a last row of the aircraft. Seat back recline might be limited due to the wall directly behind. Also, if the seat back in front is reclined, then personal space will be reduced. The proximity to the galley and lavatory area might be bothersome. 53 G None No Power Seat 53 G is a standard Economy Class seat located in a last row of the aircraft. Seat back recline might be limited due to the wall directly behind. Also, if the seat back in front is reclined, then personal space will be reduced. The proximity to the galley and lavatory area might be bothersome. 7 D None No Power Seat 7 D is a standard Business Class seat that transforms into a fully flat bed. 7 G None No Power Seat 7 G is a standard Business Class seat that transforms into a fully flat bed. 7 L None No Power Seat 7 L is a standard Business Class seat that transforms into a fully flat bed. 8 A None No Power Seat 8 A is a standard Business Class seat, however the proximity to the galley and lavatories might be bothersome. 8 D None No Power Seat 8 D is a standard Business Class seat, however the proximity to the galley and lavatories might be bothersome. 8 G None No Power Seat 8 G is a standard Business Class seat, however the proximity to the galley and lavatories might be bothersome. 8 L None No Power Seat 8 L is a standard Business Class seat, however the proximity to the galley and lavatories might be bothersome. 9 A None No Power Seat 9 A is a standard Business Class seat, however the proximity to the galley and lavatories might be bothersome. 9 D None No Power Seat 9 D is a standard Business Class seat, however the proximity to the galley and lavatories might be bothersome. 9 G None No Power Seat 9 G is a standard Business Class seat, however the proximity to the galley and lavatories might be bothersome. 9 L None No Power Seat 9 L is a standard Business Class seat, however the proximity to the galley and lavatories might be bothersome. Power outlets and USB ports are available in all classes. The United Boeing 777-200 is a long-range wide-body twin-engine jetliner with a cruise speed of 550mph and a wingspan of 199 feet and 11 inches. This plane offers several inflight amenities such as music, video, power, internet and food. The 777-500 has 50 seats in its United Polaris business class, 80 seats in its United Economy Plus and 162 seats in its United Economy. Huge improvement over old UA medieval 8-across business class. Only 4 across. Privacy great and much more storage space for personal items during seatbelt on times. All have direct aisle access - no more climbing over seatmate's legs. Only downside is that this is perfect for solo traveler but bad for couples - can't see or talk for latter. Finally - need to check seatmap for selection as "window" seats are alternating with one having seat next to two windows and seatside desk on aisle side while alternate has desk on side of partially obstructed single window with seat on aisle side. Either way there's at least some window light and they both have aisle access. UA has actually done something good for passengers! As Global service members I expected more, and we weren't even told the aircraft had changed, so our seats were reassigned and they were not good ones I had 2D and husband had 1D. No privacy and the light stays on in the galley all night. The bar carts usually are stored in the gallery in front of 1D but the steward opted to move all food service to the major food galley behind us, so we were spared the constant noise. These would have been terrible seats if food carts had been left up there. I am slim but I felt like I was sleeping on a thin plank. Not sure I like this new set-up. 01/09/19 LHR-SFO. Seat 1A now seems to be used by the crew now as a resting seat for the pilot. 1A's storage bin is used to store supplies and crew bags. 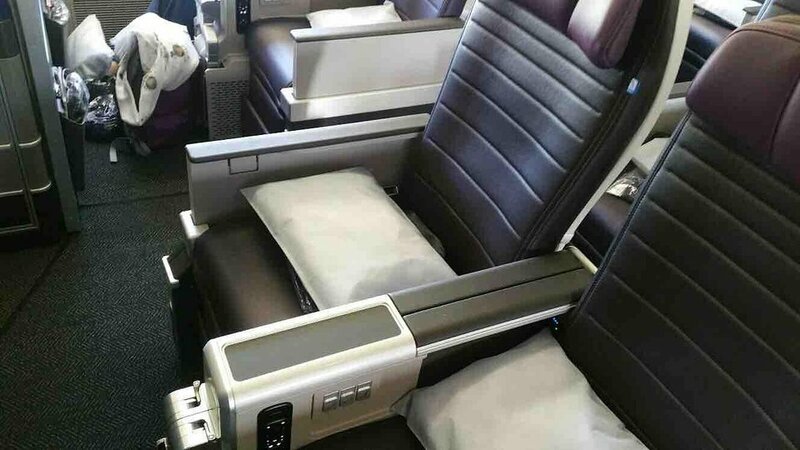 Odd numbered business seats have three window. Even numbered (angled) seats have one window. If you have to sit in the back of the plane, this actually is a very good seat. There are only 2 seats on either side of row 51 but there are 3 seats in front so if you have the B or K seat you get double under seat storage. So you can put something under the seat and put your legs out or like I did put everything in the overhead bins and stretch my legs. Even though the Lavatory is fairly close the doors face the aisle and the back. Even though I've seen a lot of complaints about the new seats, I found them to be OK for regular economy. This map on SeatGuru more correctly displays the actual seating arrangements of the Polaris® suites, whereas the diagrams on the United seat selector tools are very misleading. If there are two of you traveling together, you can sit parallel to each other with a divider n rows 2-4-6-8-10. If you are in an odd row, the divider is quite small and is on the far side of your additional table. On the even rows, your work table is slightly behind yo either to the centerline or to the windows. On the odd rows the work table is between you and the aisle, and can easily be used by the cabin crew to drop off beverages, etc while you work on the tray directly below your screen. This brand new configuration for the former three-class United metal 777s is a huge step up from the former 8-across business seats. Unfortunately, with only 5 aircraft converted so far, it is a crap shoot if you get this configuration.